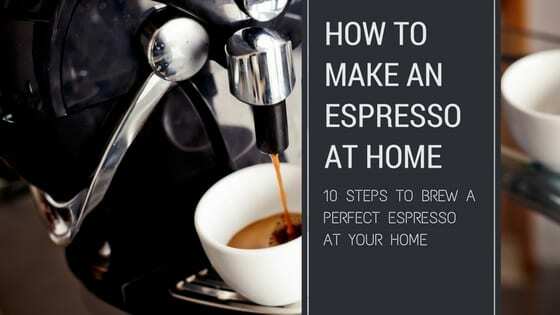 Wondering How to Clean Espresso Machine at Home? Read This! Why Is Mineral Water Served with Espresso? The term ‘espresso’ comes from ‘esprimere’ which relates to ‘force out’. This is exactly what happens during espresso brewing, because hot water being forced through coffee grounds at high pressure creates a strong, dark coffee brew. In this article we will go through all you need to know to brew an espresso at home. What equipment you require, what are the steps and a list of things that can go wrong and how to fix them. Espresso can be enjoyed on its own, or used in other coffee drinks such as cappuccinos. It’s served in small amounts (1 fl oz, or 2 fl oz for a double shot). Because of this, even though it has a high caffeine content, you don’t have to fear an espresso caffeine high after just one shot. You may even digest less caffeine than you’ll get in your weaker but large cup of regular coffee. Now without further ado, let's dive in. Espresso can be traced back to the 1880s when Angelo Moriondo patented a coffee making machine that was steam driven. This machine was improved upon over time especially in the early 1900s when these machines started being manufactured industrially. Espressos’ popularity can be ascribed to other coffee drinks that became favorite drinks of Europeans, such as lattes in the 1950s. Different groups popularized the drinks, such as the young generation in the UK in the 1950s who loved spending time in coffee shops. As decades rolled by, large companies such as Starbucks let this popularity grow, with specialty coffee and a coffee culture expanding in the 1980s. Today this culture—along with the espresso—is popular globally, though it’s still developing—with the help of coffee shop chains—in Asia and the Middle East. The history of the Espresso is a rather unique one and is worth knowing it all. Let’s turn you into an active role player in this coffee culture and show you how to make the perfect espresso. Part of the charm of drinking espresso is all the unique features that go along with it. It’s not simply a drink. Whether you’re making it or enjoying it, it’s an experience and these few things add to the novelty of it. A demitasse is that small cup you see people drink out of. Yes, you can drink espresso from an ordinary cup, but using a demitasse feels more classy, doesn’t it? Half of a coffee cup, not a normal cup you would use for measuring baking ingredients. The small size of the cup. It holds 2-3 fl oz which is half of a regular coffee cup. How to measure coffee when preparing the drink in these cups, as you would use half of the normal ingredients. Apart from espresso you’ll see people serving Turkish coffee or hot chocolate in them. With these exceptionally rich drinks it’s often necessary to consume only small amounts. Note: You’ll also hear this word in relation to teaspoons, baby spoons and surgical paraphernalia. In serving coffee these demitasse spoons are often used for spooning a cappuccino’s froth or they’re paired with specialty cups when drinks are served. This much loved drink is unique even in how people talk about it. You may be used to acidity levels referring to the amount of acid in food or substances. Not so when it comes to coffee. Just so you know, even your strong coffee with high acidity doesn’t make your drink very acidic. The average cup of black coffee has a pH level of around 5. That’s even lower than orange juice or vinegar. Acidity in espresso actually refers to flavor notes. If there are many of them your coffee will be stronger, even going so far as being bitter. Of course whether high acidity is good or bad depends on your palate. Tamping isn’t so much preparation as it’s part of the coffee making process. This is when you place the grounds in the portafilter and press down on it with a tamper to create a puck. No, this isn’t about being neat so no grounds can escape. How hard you press down—how compact you make those grounds—determine your eventual flavor experience. The water pouring through the machine, into the portafilter and then into your cup, will always flow to areas where there’s less resistance. You want the water to linger a moment in the portafilter to extract flavor from the coffee and you want all the grounds affected exactly the same. When your tamped grounds are solid without any cracks or loose areas (that can draw the water away from the other parts) you’ll get the optimum flavor you’re after. The quality of your brew isn’t only determined by the machine or the beans, but how these roasted beans are ground. With a high end coffee grinder you can adjust the fineness of the grounds to match your preference. The texture determines how much flavor is extracted. For optimum results you should invest in a conical, burr or disc grinder. Now, with all this background, you’re ready to start. Remember, preparation is as important as the process itself. An espresso machine (defined above) is the ideal way to create the perfect espresso. It can manage temperature, pressure and retention of the grounds. With some machines you can adjust settings—such as brewing time—to customize the brew according to your personal preferences. If you’re an avid coffee lover this is a smart investment. However, you can still enjoy quality espresso without a machine. With simpler tools you can make espresso, but you’ll have to practice to recreate the same strength and flavor across different brews. (If you have an espresso machine, it automatically does this for you). It requires customization in terms of timing, the texture of the grounds and how hot the water is. The tamper plays a primary role in the espresso process. It will be difficult to create a tightly packed puck without one. An ergonomic handle: You can imagine pressing down on the puck puts strain on your wrists and requires power from your muscles. A handle that easily fits into your hand makes this easier and less strenuous. The right weight: If you use a heavier tool—than plastic—it makes it easier to compact the grounds. The tighter it’s packed, the longer the water will take to run through, so your brew will have a lot of flavor. The right size: The tamper must fit exactly into the portafilter. If its circumference is smaller the grounds on the sides won’t be compacted. Yes, you can use grounds you purchased in the store. But grinding your own coffee beans will optimize your brews’ flavor. You can also adjust the texture to suit your espresso preferences. Finer grounds will always allow for more flavor extraction, while coarse grounds will simply allow the water to run through fast, which you don’t want because you’ll miss out on aroma. However, if you use alternative (DIY) brewing methods without proper filters, you may need to use coarser grounds. The bigger sized granules can be filtered easier so they don’t end up in your cup. A tamp mat: This protects your counter but is much more functional than just that. Keep utensils from slipping when you work with them on your counter. This is also how you can ensure even tamping, because the mat provides a level surface to work on. It gives enough resistance to keep the portafilter level, so you don’t accidentally create a skewed puck. A coffee puck bin (Knock box): Each puck needs to be thrown away but needs some force to get it loose from the portafilter. Bang the filter on the sturdy bin instead of damaging your regular dustbin. They’re also small enough to keep on your counter so you don’t have to waste time walking to the dustbin after each brew. Scale: As mentioned, accuracy is key with espresso making. To ensure you get the exact amount of grounds, measure them out on an accurate scale (Kitchen or barista styled scales are available). Brush: Keep your grinder and countertop clean from old granules. Shot glass: If you want to deposit the perfect amount of espresso into each of your guests’ cups, measure it out with a marked cup. Don’t simply pick the first pack of beans you see. Beans determine the quality and flavor of your brew. You can use almost any coffee beans and even flavored ones. You’ll find espresso beans in stores, which are usually dark roasted. These allow for optimum taste when beans are ground very fine, which is the best texture to use in espresso machines. Got everything you need? Then let’s show you how use an espresso machine. As part of getting all your gear ready, make sure they’re clean and dry. You don’t want a previous brew’s grounds affecting your new drink. Even moisture can ruin a cup, because a wet portafilter will moisten the coffee from the bottom and affect extraction. It’s also smart to run a bit of water through your espresso machine via the brew head to ensure it’s clean. If you have a state of the art machine it’s probably connected to a water source. If not, make sure there’s enough water inside. Remember, making an espresso incorporates chemical processes, so all the substances you use will affect the outcome. Therefore it’s ideal to use filtered water, rather than normal tap water. The other benefit of using filtered water is that there will be less residue in your machine, so you don’t have to descale it as often. Water temperature is a vital component of the perfect brew, so ensure your machine is heated up by the time you want to start brewing. This could take up to 30 minutes depending on the machine you use, so coffee making requires some good planning. As mentioned it’s best to grind coffee beans yourself. But here’s the key to a good cup: Grind it just before you make your drink. If you don’t want the flavor of your grounds to escape, it shouldn’t be exposed to air and oxygen too much. Once again this can cause a change in taste because of oxidation. Handy skills aspiring baristas should acquire are accuracy and consistency. If you want each cup to taste the same—incorporating all you favorite features of an espresso—you need to be exact during each brew. When you gauged the correct weight with a kitchen scale, determine exactly how much it is with a measuring spoon so you can easily spoon that amount into the portafilter in future. ​You can place your portafilter on your kitchen scale, tare it to zero and then pour in your grounds until you have the right amount inside. It’s one less step and minimizes the risk of messing coffee grounds all over your kitchen floor when you transfer grounds from the scale to the portafilter. The all important tamping process! Ensure there are no air pockets or irregularities in your puck. You also want the same level of coffee across the entire portafilter. Now position your tamper on the coffee in the portafilter and press down hard. Guard against letting the tamper tilt to one side. Don’t try doing this in mid air. Rather place the portafilter on the counter so you can press down with all your strength. Don’t tap the portafilter again after tamping, because you’ll loosen the granules you just compacted. Remember temperature is central to success in espresso making. This isn’t only about how you use the machine but how you serve the drinks as well. Warm up the cup before you pour espresso in. A cold cup will instantly change the temperature of the espresso and adding hot water or warming it up can alter the taste. So let’s ensure your cup helps maintain the heat. At last you’re prepared for the actual brewing. Don’t let a lot of time go by between packing (and tamping) your grounds and starting to brew. If you cleaned your gear and the portafilter was hot, this heat can actually affect the grounds by burning them. So work swiftly. Slot the portafilter into the brew head. Once again you need some force to ensure it’s firmly set in place. If it doesn’t seal properly the water will escape through the gaps when you start brewing. Remember to place your espresso cup (or demitasse) under the portafilter’s spout before you pull the shot. Automatic machines: Modern, high end machines are designed to stop pulling at the right moment. This is according to the amount of water that ran through, how much of the grounds were saturated and whether all the flavor has been extracted. They may allow customization so you can get stronger or weaker shots. Look at the color: You want the liquid running into your cup to be of a consistent strength. This can happen if you packed your puck correctly and the water can saturate all the grounds in the same manner. At some stage the water won’t extract optimum flavors anymore, since most of it has been used. You’ll have visual confirmation of this when the liquid turns a lighter color. It’s called turning blonde and instead of brown coffee you’ll get orange or beige liquid. Stop the machine the moment the color turns, otherwise your espresso will be weak. Now you can drink your espresso or serve it to someone else. Espresso is loved for its strength and most coffee aficionados don’t require additives such as milk, cream or sugar. For stylish serving an espresso cup should be placed on a matching plate. Cleaning is as important as making your coffee, mostly because you want your next cup of coffee to be as good as the first. Remember, any residue can affect the taste of the next cup. Now you’re ready to start measuring, tamping and brewing again. View your espresso making as an adventure and a journey. You can discover better ways of brewing to improve the taste of your espresso over time. One way of finding ways to improve a brew is to fix the things that went wrong in your last brew. Here are a few general mistakes that can easily happen. More troubleshooting ideas in this article. If you know the source of the problem you can remedy and prevent it. Let’s start by saying bitterness isn’t necessarily wrong. Espresso isn’t the sweetest of coffee drinks and if yours is bitter it’s a good thing. But it shouldn’t be TOO bitter. This is why experimentation is such a huge part of espresso making. One of the reasons your coffee drink is bitter is the texture of the grounds. When grounds are too fine, the brew can be over-extracted. This means too much of the coffee beans’ characteristics were pulled out during brewing. Brewing draws out chemicals and oils; when the wrong ones or too many have dissolved into the water, it ends up bitter. Alternatively your espresso machine’s temperature setting may be too high. Scalding hot water will affect the grounds differently than water at the optimum temperature. Lastly, it’s possible you’re over extracting the coffee. While the first part of the brew can taste amazing, the last dregs only contain bitter compounds. The grounds are already spent by this time and no tasty flavoring is left. Adjust your grinder and try grounds that are slightly coarser and see how it affects the taste. Keep on customizing until you have the perfect texture. If you can, set your machine’s temperature a degree or two lower. Stop the machine a few seconds earlier before the bitter compounds start running through. This is the opposite problem of bitter and it’s definitely not an acquired taste. The sourness is the tannic acid that’s found in coffee beans. It means you extracted a compound you don’t really want. Basically you’ve only extracted some of the amazing coffee flavors your beans contain. This easily happens on large granules because it’s more difficult to get these parts saturated so the compounds can start reacting (dissolving) with the water. Large granules also allow water to run through quicker than find grounds. Once again there’s no time for the flavors you love to dissolve into the water. You’re one step closer to the perfect cuppa. The right technique will result in a dark cup of liquid with brown foam on top. The foam is coffee bean oil which is emulsified during the brewing process. CO2 from the grounds and the hot water meet up to form tiny bubbles. They’re so small that they actually have a creamy texture. Note that it’s an unstable substance so it will eventually dissipate if the espresso is left on the counter for too long. However, it’s a trademark of a quality espresso, so if it’s not there right after brewing, you need some adjustments. Once again your grounds’ texture can be the source of the problem. If they’re too fine and a compacted puck gives too much resistance to the water, it won’t flow through but rather just trickle. This trickle is not enough to create the bubbles you want. This also relates to how your coffee is tamped. If it’s too loose the water will simply run through quickly without generating crema along the way, because there’s sub par extraction. The problem may be your beans because the oils in the beans form part of the reaction. Low quality beans simply won’t have the compounds to produce crema. The water must be at a temperature that causes sugars to caramelize. Either increase the temperature, or invest in a machine that has a boiler with excellent heat retention. Brass boilers are more effective so you know the water running through the grounds is piping hot. Without enough pressure the water won’t run through the granules at the right speed. You at least need nine bars of pressure (15 is even better) to create the momentum you need. Invest in a high end machine that delivers high pressure. From the notes above you probably gauge how all components work together and affect the brew. If you let the machine run for too long, weaker brew will be added to quality brew, resulting in a weaker—and possibly bitter or sour—espresso. Yes, to know how to make espresso takes a bit of effort. But if you’re after that perfect cup of espresso you have an exciting journey ahead of you. Take time to read your machine’s manuals and combine the directions with the knowledge we gave you here. It’s a process of trial and error, but one day soon you’ll taste an espresso you brewed yourself and realize you’ve created PERFECTION. Do you have a few tips that can help the rest of us get the most out of our next brews? Please share your insight in the comments below.